Truly funny novels are a treasure, hard to find. 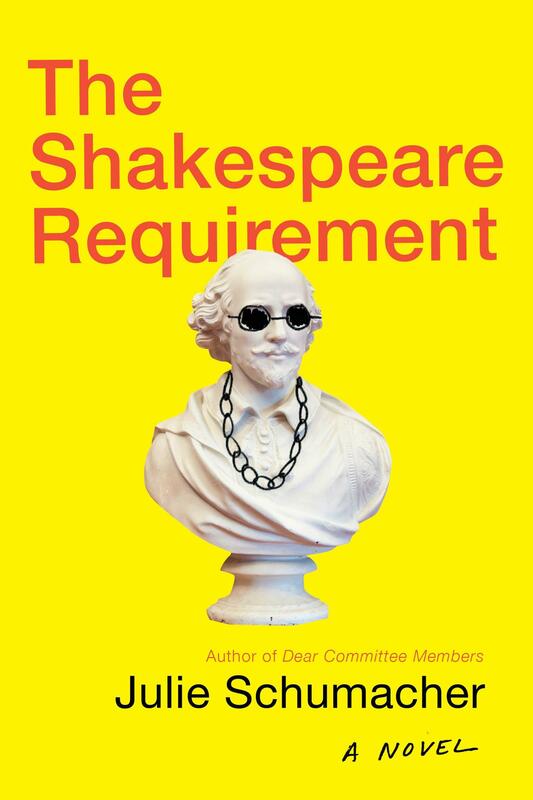 “The Shakespeare Requirement” is a delight, a sequel to “Dear Committee Members,” Schumacher’s comic novel comprised of letters of recommendation, some straightforward, some facetious, some subversive, written for his students by Professor Jason T. Fitger of Payne University, a nondescript midwestern school. Fitger, who has been at Payne 25 years, is a not very successful novelist teaching fiction writing. But discord is so ferocious in the English department that he is made chairman. No one else will touch the job. “The Shakespeare Requirement” opens, as academic novels must, with the start of the school year. It will close at commencement, in much the same way as Perry Mason novels begin with a crime and end with a jury trial. But this story does not open with optimism, characters excited about a new beginning, a fresh start. To begin with, the chairman’s office, on the first floor of Willard Hall, is dirty and hot, and “custodians were responsible for bathrooms and public spaces.” He would have to clean it himself. His phone and his computer are not working, and he is informed that everything—all messages, emails, appointments, notices—must go through “P-Cal,” the university site. Fitger still uses a paper calendar. Fitger, like most English professors, thought the purpose of English departments was to study literature and learn to write clearly. This pompous and useless document must be approved by his faculty unanimously. Fitger will have to deal with his faculty one at a time, like the speaker of the house, bribing and threatening and cajoling each separately. One wants to teach only at midday. Another refuses to be on any committee with certain of her colleagues. Moreover, there is one seemingly impossible issue: the Shakespeare requirement. Professor Dennis Cassovan has devoted his life to the bard and believes no English major should graduate without at least one semester of Shakespeare. There is civil war within and threats from without. Dr. Roland R. Gladwell, chairman of economics, the department upstairs, is a whiz at bringing in alumni money. His territory has been elegantly renovated, with technology-enhanced classrooms, skylights, mosaic tile floors, and a café. Like Hitler eyeing the Sudetenland, Gladwell means to expand and take over the English department space as well, driving them finally from the building altogether. English, it is noted, generates few rich alums. To further his scheme, Gladwell volunteers to chair QUAP, the campus-wide Quality Assessment Program. Data will be collected, numbers gathered and crunched. “Inefficient” departments, departments with falling enrollment, which bring in few contracts or grants, will be deemed of poor quality and staff reduced or eliminated, the freed-up funds moving to, of course, departments like economics. Still reeling from an unwanted divorce, and with his ex-wife now dating the dean, Fitger, hopeless sad sack that he is, perseveres, showing compassion to lost, confused students and depressed, underpaid faculty. Against tall odds, he fights for traditional academic values. I have always been glad that the professors in charge of curricula at medical schools do not adopt this position. Imagine a world in which your internist, unknown to you, had opted not to study diseases of the liver. “The Shakespeare Requirement,” like the Shakespearean problem plays—“Measure for Measure,” for example—contains peculiar characters and not just plot twists, but mood swings. We have here a kind of tragi-comedy, hilarious and sad by turns, but finally a success and a delight.